Professor of Music Theory and Director of the Center for American Music, Dr. James Buhler, has a new book published by Oxford University Press. 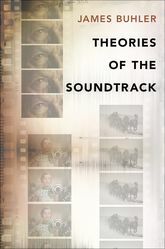 Theories of the Soundtrack is a first of its kind comprehensive investigation of soundtrack theory. This book is concerned with summarizing and critiquing theories of the soundtrack from roughly 1929 until today. A theory of the soundtrack is concerned with what belongs to it, how it is effectively organized, how its status in a multimedia object affects the nature of the object, the tools available for its analysis, and the interpretive regime that the theory mandates for determining the meaning, sense, and structure that sound and music bring to film and other audiovisual media. Beyond that, a theory may also delineate the range of possible uses of sound (and music), classify the types of relations that films have used for image and sound, identify the central problems, and reflect on and describe effective uses of sound in film. This book does not provide an exhaustive historical survey but rather sketches out the range of theoretical approaches that have been applied to the soundtrack over time. For each approach, it presents the basic theoretical framework, considers explicit and implicit claims about the soundtrack, and then works to open the theories to new questions about film sound, often by putting the theories into dialogue with one another. The organization is both chronological and topical: the former in that the chapters move steadily from early film theory through models of the classical system to more recent critical theories; the latter in that the chapters highlight central issues for each generation: the problem of film itself, then of image and sound, then of adequate analytical-descriptive models, and finally of critical-interpretative models.